Lehigh Valley Zoo Animal Care Department – Hi everyone! My name is Chris and I am one of the keepers at the Lehigh Valley Zoo. I have been employed at the LVZoo for three years now and I am so blessed to be able to work here. I have always known that I wanted to work with animals and to play a part in the conservation and care of wildlife. Being a keeper has helped me fulfill that dream and I work with and care for some amazing species. Being a zookeeper is not a glamorous job, but it is fulfilling and meaningful; it gives me purpose. Every day at work is different. My day starts at 7 am when the animal care team has their daily morning meeting to go over what is going on for the day and what tasks need to be accomplished. Then the keepers go off on their routines after getting all of the diets and materials needed for the day. This is when we go thoroughly clean all of the exhibits and animal areas. We check on and feed all of our animals. We also make sure the zoo grounds are well maintained. I take inventories of various supplies and items we use every week so that we can provide the best care possible. Creating and providing enrichment to our animals is also a big part of our job. 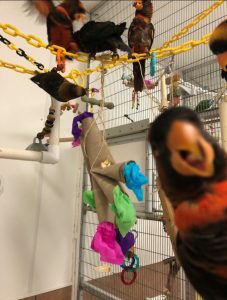 We give our animals various toys, puzzle feeders, scents, and novel items and foods to stimulate their minds and senses and to promote natural behaviors for each species. As keepers, we observe and provide quality care for the animals that call the zoo home. I also educate zoo guests during daily keeper talks about the various animals at the zoo and their importance and conservation. Educating and interacting with zoo guests is a very important aspect of being a zookeeper as well; inspiring people to action to help, admire, and respect wildlife is a part of our mission. In addition to being a keeper, I am also one of the enrichment coordinators for the zoo. This means I submit and approve enrichment proposals, I create and make various enrichment items for the animals, I inventory all enrichment items, and I record all enrichment provided to every species at the zoo. I observe the reactions of the animals to the enrichment items and make sure the items we provide are safe for the animals. Our goal is to provide enrichment to promote natural behaviors for each species that will help provide the most natural environment and lifestyle for them. One of my favorite parts of this job is creating and making my own enrichment items and then seeing the animals using and enjoying that enrichment. A major part of my day as a zookeeper includes training the mongoose lemurs and the Kordofan aoudads. I train both of these species every day that I work. 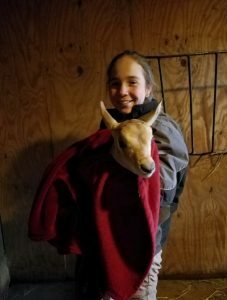 This training consists first of establishing a trusting relationship with the species and then using positive reinforcement to show the animals that the training is a positive and enriching experience they will want to participate in. Most of my training is for the overall goal of providing the animals with a form of enrichment and to lessen as much stress as possible, such as lessening stress during vet check ups. I am also the author of the zoo’s weekly Monday Morning Conservation messages. These messages are based on a different species and/ or a conservation issue each week. They are posted on the zoo’s facebook page and are sent out to the zoo’s email list. I write about the specific species, the threats they face, what conservation efforts are being done, and what we can all do to help. I love doing this because I feel like I impact and inspire more people to become involved and to appreciate different species. I can spread awareness this way. Being a zookeeper is a lot of hard work and physical labor to ensure the animals are receiving quality care and welfare. We make diets, create and provide enrichment, clean the exhibits and zoo grounds, fix and maintain all animal areas and grounds, educate the public, and much more. Being a zookeeper means working long days, working on weekends and holidays, and going to many meetings. But this is all for the animals we care for and for the conservation and continuation of amazing species that help maintain balance in the ecosystem. I love my job and I am truly lucky to be a part of the Lehigh Valley Zoo and to be able to care for these species and to contribute to their conservation. 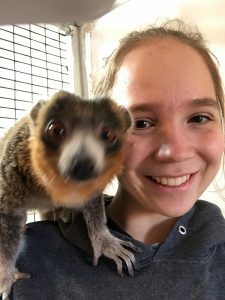 I hope this has provided some insight to what being a zookeeper is like and how important our job is. 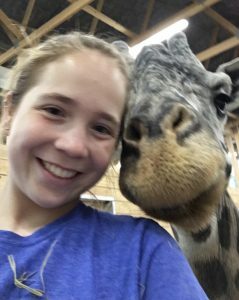 I hope you visit the zoo soon to see all of our amazing animals and to learn more about them and to become a part of the zoo family!